It was one of those comments that reached beyond the friendly acknowledgement bands typically give to their openers. You could tell Rinehart meant it, and for good reason. 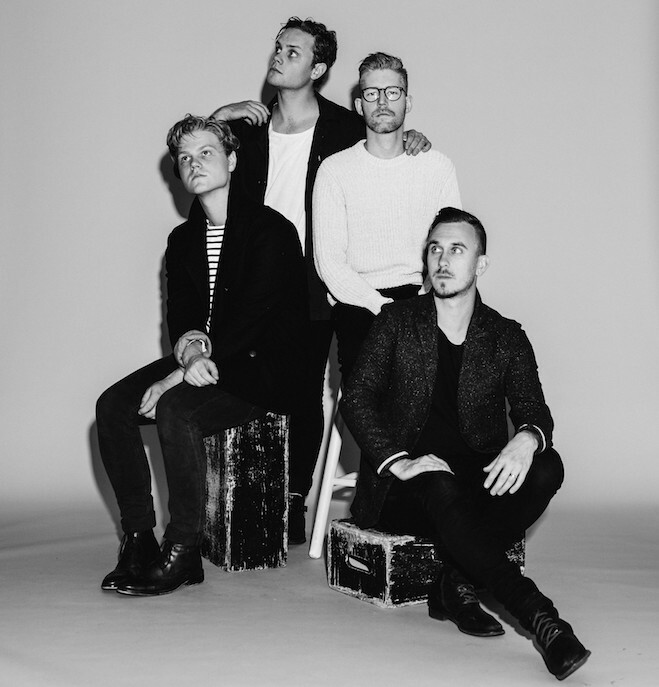 Colony House has been a model workhorse band the past tour cycle, logging more than 200 shows, paying their dues in the industry, and earning the widespread respect of their peers across the indie rock scene. Two years after the release of their freshman album, When I Was Younger, the band is hard at work getting the word out for their new record, Only The Lonely, set to drop early next year. All Things Go had a chance to speak with frontman Caleb Chapman after the band’s show at D.C.’s Rock & Roll Hotel. For those reading this who aren’t familiar with Colony House, can you give us a quick summary of who you guys are, where you’re from, and what kind of music you make? Caleb Chapman: Totally. Colony House started in Franklin, Tennessee, which we call home. We named our band after the apartment complex we were all living in when we started the band. It started out as me, my brother Will, and Scott Mills on guitar. And then just this year we added a fourth member, Parke Cottrell to the fold. If iTunes were defining us we would be an alternative rock band from Franklin, Tennessee. Let’s begin by talking about your first album, When I Was Younger. As the title suggests, it’s rooted in the past and feels like it emerged from your childhood. What were some of the big ideas, themes, or experiences that inspired that project? CC: Before we really knew exactly what we were doing – when we were trying to figure things out – there was an artist named Andrew Peterson who we went out with. We were his band, and he was a guy early on who was like I see something with you all. I believe in you. This was before we even started making When I Was Younger, and he had just put out this album called Life of a Lost Boy, which had a similar theme about the loss of innocence – watching his sons grow up and almost reliving his childhood through their eyes a little bit and remembering all of those times gone by. I don’t know if I realized it at the time, but I think that was a huge influence. It was what we were submerged in, so when we started writing a lot of that was on my mind. A lot of the songs (from When I Was Younger) came out of the place of losing my little sister in an accident – just observing life with all the beautiful things and all of the tragic things, and looking for how to balance all of that out. I think we were kind of obsessed with nostalgia and that feeling of looking back with fondness on the past, and making sure that as life happens we don’t lose sight of all those beautiful things. That was a huge part of the album. There’s one lyric from that record that I’m particularly curious about. In the song “Caught Me By Surprise” you sing at the end, almost as an echoing refrain, “Leaving and escaping aren’t the same.” What were you getting at in that line and in that song? CC: To tie it into what I was talking about, there are these decisions we have to make when life happens – in this case when something tragic happens. I think there’s a choice that we make. It’s an interesting lyric because as I’ve dug into it myself and wondered “Ok, what does that mean? What did I mean by that?” I’ve decided it’s kind of up to the listener which one they choose – which one is the positive and the negative of the two. I think when I wrote it, it meant that leaving something is a choice, and escaping something is more of a survival mechanism. Human nature is to try to escape the hard things, so it’s a challenge to make a conscious decision of leaving that in the past, in a moment of time, and making the conscious decision to move forward from here. They’re the same thing in essence, but there are different connotations with the words, so I guess it comes down to being intentional with our decisions and the choices we make. That’s interesting what you said about reevaluating songs you’ve written and asking yourself what you really meant by them. Have you found that those older songs you’ve written have continued to shape you or have even acquired new meanings for you as Colony House has grown as a band? CC: Yeah definitely. If we’re looking back on the music that we’ve written, new things come to life that maybe we weren’t as focused on at the time because it wasn’t the song that was getting all the attention. Or someone comes to a show and says “This song meant so much to me,” or “This lyric meant so much to me.” These things pop up where you go Oh yeah, that does kind of have a potency that maybe I forgot about in the time that has past. That record took us two years to make and then release. It’s now been out for two years, so to us it’s four to five years old. A lot of those songs have been around for a long time. But just two days ago, someone asked about “Silhouettes” – the breakout single of the record – asking me to break down what the song means. It’s always good when that happens. It keeps me on my toes so I don’t forget what I’m singing. When you do this hundreds of times a year in front of people the words can start being just words. It’s nice to remember, “Oh yeah, I want to go back and remember why I wrote these words,” and explaining it sometimes does that. Anyways, to segue into the next record, I tried to not analyze as much at the top of the record when I was initially writing these songs as I did in the past. There’s something awesome that happens when you kind of let go – when you’re working on a demo or something and you just sing something random. It can make absolutely no sense. It’s all thrown in just to get the idea of the song down. But every now and then – and actually it’s not as rare as you think – you say something that is striking enough to form a whole song around, and it came from nowhere! It wasn’t like “Ok, I want to write a song about world peace; here we go: world peace is this.” It’s like you just say something and if you free yourself up enough, you end up saying something you wouldn’t have expected. Songwriting is addicting in that way because it’s kind of like fishing. You don’t know what you’re going to get on the end of the line, you don’t know what bait is working, you just kind of go out, throw your line in, and see what happens. Let’s talk about your new record, Only the Lonely. On your website you have a quote by Tennessee Williams, “When so many are lonely as seem to be lonely, it would be inexcusably selfish to be lonely alone.” What’s the story behind that quote? CC: Before we rolled out that we were releasing a new record, I went into research mode a little bit. The universal bond of loneliness is a thread that weaves us all together, and so I was looking up all these quotes. It was like the most inspiring thing in the world to do, because that’s one that there’s not a shortage of – the idea of being lonely. You have some of the most brilliant minds in the world talking about their encounter with loneliness. I was just feeling through all that and obsessing over all these people’s’ takes on it. You’ll hear the word “lonely” or “alone” all throughout our new record, and so it became this theme. It started out with us being on the road. We played over 200 shows on the last cycle, and being gone for a long time, with this weird juxtaposition of being surrounded by people all the time but feeling alone as well, is something that was interesting. I also had a lot of friends dealing with relationship stuff at the time, and a theme that always came up was feeling isolated or alone. It was all around us over the last two years, so it was hard to not write about it. But going back to that quote, when we were thinking about naming the record, we had a song called “Lonely,” and we wanted to just call the album Lonely, but it felt a little stark, because it’s not a downer album. It’s kind of an observation on loneliness and how to deal with it in a good way – or how it can be dealt with in an unhealthy way. When I came across that quote, it made loneliness a collective a little bit. I found it challenging and interesting to just say, Well, I’m alone in this world. That’s actually selfish, because everyone feels that. But rather than surrendering to being lonely, to that idea that I’m alone, it’s like, “No, you have to fight that”. You have to exist with the people around you and say “Hey, it’s our natural tendency to isolate ourselves and to walk backwards from a situation, but what’s not natural – but what has more power – is to hold hands with each other and go into this together.” I think it’s interesting with the climate of our country right now and our world, us holding hands isn’t something that we see a lot of – at least the news doesn’t report a lot of it. So I think it’s timely to say the only way to combat all of these terrible things that are happening and all this terrible news that we’re hearing about is to hold hands and say, “You’re not alone; I’m not gonna let you isolate yourself, we can do this together.” It can sound really cliche, but the reason why something is cliche usually is because it’s true. Were there any other great quotes you came across in your research? CC: Another one of my favorite ones is this Vincent Van Gough quote – which is also one that we quoted as part of the buildup to letting people know we were releasing this album. It goes, “A great fire burns within me, but no one stops to warm themselves at it, and passers-by only see a wisp of smoke.” Now that’s not a build-me-up quote, but I think a lot of artists feel that way, like I feel like I have so much to give, if only there was a way for people to see the fire that I feel inside of me. So maybe that’s this album for us, hopefully fanning that flame and more people seeing that spark. You said that this isn’t a “downer” album, and if the singles you’ve released so far are any indication, it’s actually pretty upbeat and fun. How does the sound you’re going for tie into the theme, and what were some of the artists who inspired that sound? CC: It’s interesting because this album has songs that are like fists in the air, like “Yes, inspiration!” then there are songs that are, well, it is what it is – like the song “Lonely.” I feel like I have to fight the urge to resolve every song with a twist of happiness at the end, because the truth is there are chapters in our lives that just aren’t that. There’s kind of a dot, dot, dot instead of a period. And so that’s what this record is, there are some songs that end with an exclamation point, and some songs that end with a dot, dot, dot. Musically it’s definitely more of a raw record than When I Was Younger. We approached it trying to capture more of the live feel of our band just because we had such good feedback on that with our last album. So it was like Ok, well maybe we should lean in to that a little bit more. And so a lot of the album we live tracked. We were all in the room tracking it together, just to try to capture some of that energy. And we really challenged ourselves. So when it comes to inspiration, do you think you’re a better songwriter when you’re happy and full of joy, or when you’re more in a place of heartache or wrestling with something heavy? CC: I feel like my initial response is to say it’s easier to write songs when you’re in a hard place, because it’s an outlet. I don’t know if you get a better product from that – if you get a better song from being in that place. But I think the best songwriters are able to tap in and out, because we’re always kind of in this boat that rocks back and forth emotionally between the highs and the lows of life. One day you can be feeling awesome, the next day you can’t move. But there are certain things for me personally that are probably traps as far as songwriting. Like if I’m not in a good place relationally, whether it’s my wife or my friends or my family, then I feel like my well dries up a little bit, because it all hurts a little bit more. It’s interesting because sometimes, your most beautiful or heartbreaking song might come from something like that, but in general it’s harder for me to write when I feel like my scales are unbalanced and I’m not in the right place. It’s a great question, and I’m sure you’d get a different answer from everyone. I don’t really know where I land on it, but I’ve talked a lot with my dad about this. My dad’s a songwriter as well, and he has an interesting take on the drug of being an artist. In songwriting there’s something that’s really interesting. He says as songwriters and performers we get addicted to this feeling of being about to resolve something. Even if there’s not a resolve in the song, it’s like you write a verse and a chorus, a verse and a chorus, a bridge and an outré and you’re there, you’ve arrived. You can start and finish something. And I think the reason you see a lot of these brilliant minds and brilliant artists kind of crumble emotionally or psychologically or whatever is because they get so addicted to that feeling of being able to start and finish something. But when they go home and they’re trying to deal with their kids or their family or their friends, there’s not always a start and a finish. A lot of times it’s a journey. You can’t resolve every problem in three minutes in real life, you know? It’s something I’ve kept in mind a lot, because a lot of times when you’re on the road and you go home, or when you’re in record-making mode and then you go home, you have to shift your mind around and go Ok, it’s not as if one’s the real world and one’s not, but my brain has to be in a different place now, my heart has to be in a different place now. I think that’s an interesting insight into songwriting. So if songwriting is a drug, which of all the songs you’ve written so far is the most satisfying? CC: You might get a different answer from each person in the band, but I’ll be selfish since you’re talking to me. There’s this song on the new album called “This Beautiful Life.” It’s the last track. There are certain songs that feel like they just kind of write themselves. It doesn’t take a lot of effort, it’s just kind of like it was supposed to happen. And this is one of those songs where it almost wrote itself. Without diving way into it, it’s probably the only true ballad on the new record. It’s the only song the acoustic guitar makes an appearance on, which is different from our last album. The process of recording it was really special because it was a one take thing for me. I sang it and played it. We did it like three times and we just picked the best take. My dad was there, which was cool because he wasn’t there for much of the record-making process, but he stopped by while we were doing that, and it was a special moment. So even in the production of it it’s a really special song – it’s really, really raw. So there’s this fond story of recording the song. But as far as content, it’s an important song on the album because it’s really inspired by all the interactions we’ve had with people throughout the last couple years while touring. We go out to the merch table after every show and hang out. And it’s fun to get to say thanks to the folks who have bought your album and come to the show and to hear the stories of why our music means something to them. So all those interactions and the people we’ve met were a big influence on “This Beautiful Life.” It’s a song that asks the question why – for me why I do what I do. It’s the big universal question – why are we here? Again, it’s a cliche question that everyone asks, but it’s a true question that everyone asks. And what’s beautiful about the song in my opinion is it doesn’t answer the question because that would be really really pompous. That said, I think that it’s an important question that everyone should take really seriously. Maybe this song can be the first time someone really asks that question, because I think people find direction for their lives when they can sit down and be like Ok, all these things that happen around me – these beautiful moments, these terrible moments, these wonderful things – what does it all mean? Why does it happen like this? Why am I moved by this, and why am I moved by that? I don’t feel like I’m dancing around anything with the song. It feels really honest, just asking a really sobering question of why we exist. I think it ties into the lonely theme in a not-trying-to-hard kind of way. It was like at the end of all these feelings that I’m better off when I’m not alone, I’m feeling lonely today, whatever – at the end of it all I gather this data and this information and I can ask this question with it. It seems appropriate. Thanks so much Caleb. To wrap things up, can you give us a snapshot of what Colony House is up to right now? And what are you guys excited about these days? CC: We’re finishing up this tour with a band called The Mowglis and Dreamers, and they are awesome. So it’s been super fun making new friends with those guys and girl. Then we head back home to do random shows for a couple months until the end of the year just building up the record, press stuff, and then drop the record in January. I’m glad we’re on tour, because we always feel like whenever we start asking What are we doing? What are we doing? tour always feels like Ah, we’re working, this feels good, our hands are busy. So yeah, right now we’re trying to play shows, starting to work on new songs, and trying to come up with fun ideas of how to build anticipation for the record. It’s like hurry up and wait. We’re in the hurry up and wait phase, but we’re so excited to start playing these new songs and letting people hear them.